Show off your favourite Instagram photos on one of our unique personalised cushions. 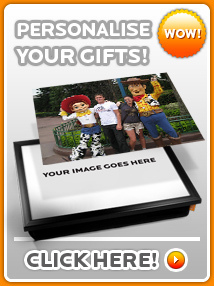 This tray fits 6 photos but a 9 photo version is also available in a larger cushion size. These funky sofa cushions are made with a super soft and fine faux suede fabric - 'luxury' compared with others in the shops! The cushion covers can be removed and are machine washable at 30 degrees. Very securely stitched with high quality cotton. Comes complete with the cushion insert pad which is generously filled for comfort. Archival inks are used to achieve the brightest, saturated finish possible. Hand made to order by British hands in the UK. These cushions are available in Small (28x23cm), Standard (45x45cm), and Large (80x80cm) - something to suit any bed or living room sofa. No zip is used on our larger 45x45cm size cushion and instead features an envelope opening which makes for much easier removal and also won't scratch any leather sofas. The 80x80cm size cushion does feature a zipped edge but is well covered. Hand made to order by British hands in the UK.